The Liverpool based company won two competitive tenders issued by Liverpool Vision and worked closely with creative design specialists Evoke who planned the various environments and event meeting spaces that were utilised throughout the Festival. Adlib invested around £250,000 in new equipment to help provide a world class set up for the high profile event. The scope of their work included helping to create The IFB’s Trade and Investment Hub and nerve-centre inside the Merseytravel building on Mann Island, which featured its own programme of events. Additionally, the second tender dealt with providing technical services and equipment for around 150 main events in the Festival that focussed on creating new international and domestic business-to-business relationships and commercial openings for UK companies of all sizes and sectors. The 50-day IFB was the first edition of a new concept and the largest global concentration of business events during 2014. Running across June and July, it attracted business delegates and trade intermediaries from worldwide to one of the UK’s most exciting – and hospitable - cities. 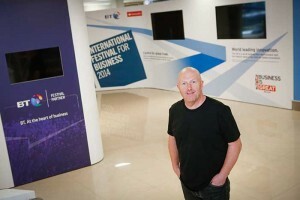 The massive project was managed for Adlib by director Mark Roberts who commented: "IFB was the largest business event in which we’ve been involved to date, and something that is completely unique. 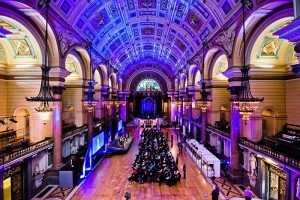 We are exceedingly proud that Liverpool was chosen as a host city and also that we had the chance to rise to the many challenges and provide an unparalleled service to the required standards of excellence." The Hub was designed as a multi-purpose high tech aorta for all IFB activities with break-out conference, meeting and seminar spaces on three floors. The ground floor included a bespoke stage style reception/registration area, an interactive pentagon shaped pod (fitted with five interactive screens utilised to navigate video footage of exciting projects within the City regions) and branded exhibition walls featuring presentation screens that welcomed and directed all visitors to the IFB HUB. On floor 3, eleven different spaces were created - again with walls installed by Adlib - together with The Cube, a 40-capacity conference area. A dedicated exhibition area featured a large LCD projection screen, and assorted infrastructure was deployed to support seven different exhibitors running for the duration of the event created by a variety of organisations. Infrastructure to support six ‘Pod’ meeting rooms was also installed, together with a Green Room zone and the ‘Pub In The Hub’, a vital after-hours networking, socialising and meeting place that buzzed with activity after 6 p.m.
Up on the fourth floor, Adlib co-ordinated the technical requirements to support a Mayoral Suite - used as the Mayor Office of Residence for IFB 2014, BT’s boardroom and Liverpool Vision’s CEO and Production offices, as well as another Green Room and assorted press and media briefing areas. The entire Hub was also dressed and neatly finished by Adlib using a selection of drapes, soft goods and custom elements. "A huge amount of effort went into these finishing details," explained Roberts, "They were as important to get right as the fundamental technical specifications." The fourth floor – with its amazing panoramic view – had a fully equipped conference and event space, made available for presentations, plenary and networking sessions, complete with live satellite video link capability, etc. "The biggest challenge of co-ordinating all elements for the Hub was meticulous planning and execution," explains Mark Roberts, adding that although it was a completely different ball game from running a large scale gig, the basic building blocks were ostensibly similar. Physically the most galvanising aspect was getting all the kit up and down eight flights of stairs, together with installing environments to the required standards from completely bare spaces … and seven weeks later, leaving the building exactly as they had found it – without so much as a scratch, scuff or a smudge on the walls or floors. "I am pleased to say that we also scored 100% on this front," says Roberts bristling with pride. Adlib’s brief also included providing staff to run all the facilities with multiple events happening daily where around 25 engineers supported head technicians Dan Brown and Jon Priest whilst Tim Robinson dealt with the gargantuan task of warehouse logistics. Client management was overseen by Suzanne Adams. 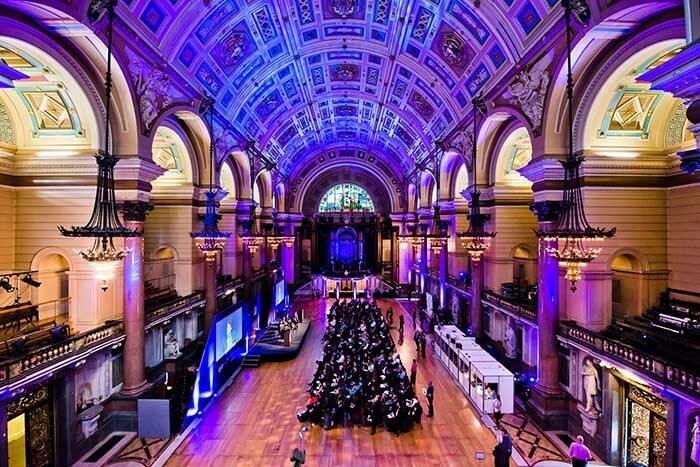 Signature events taking place during IFB for which Adlib provided production audio, video and lighting include The BT Global City Leaders Summit at St George’s Hall, and The Business of Food and Drink gala dinner staged in the Liverpool’s majestic Anglican Cathedral which was transformed into an atmospheric event space for the evening. The IFB was visited by around 75,000 people from 88 countries, with The Hub itself welcoming over 12,000 visitors and delivering 130 events of which Adlib was an integral part. "We thank Adlib for their excellent event production services which were of the highest quality," concluded IFB director Ian McCarthy.